Sector Rotation is an investment strategy involving movement of money from one sector to another. Sector Rotation is shifts in and out of sectors, like healthcare, financials, energy, etc. The shifts between sectors are often called “rotation”. The concept of Sector Rotation isn’t anything new. It appears Sector Rotation observations started from National Bureau of Economic Research (NBER) data on economic cycles dating back to 1854 that assumes the existence of well-defined economic cycles. Sector Rotation assumes that investors shift or rebalance their portfolios as their views about expected returns and risk change. In Sector Rotation analysis, we use the term Sector Rotation to refer to money flowing out of one sector into another sector. For example, we may observe a trend of the technology sector declining at the same time consumer staples or utilities is rising. These money flow trends may be assume to be investment capital rotating from a cyclical industry that is more tied to the economy to a more defensive industry that is not. Or, the Sector Rotation could be declining defensive stocks and rising cyclical stocks. Another sector observation indicate the potential stage of the economic business cycle. The business cycle influences the rotation of stock market sectors. 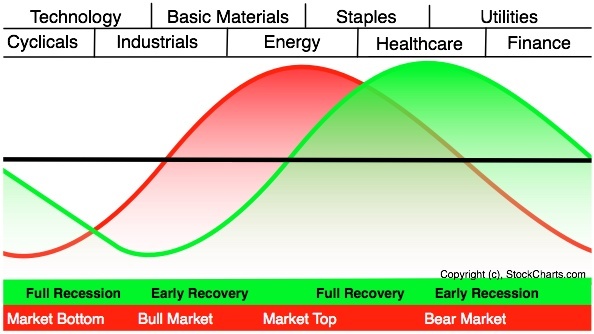 Certain sectors perform better than others during different phases of the business cycle. In sector analysis theory, understanding the stage of the business cycle can help position in the right sectors and avoid the wrong sectors. Below is an idealized graph of sector strength and weakness during periods of economic strength and weakness. Sector Rotation as an investment strategy aims to rotate between sectors rather allocating to them. Some Sector Rotation strategies try to determine the stage of the business cycle and position their sector allocations to those expected to be strong and away from those expected to be weak. Sector Rotation can be applied with skill and understanding of how markets interact with each other. Sector Rotation using relative strength and momentum rotates between sectors by buying only the sectors that have risen the most recently and avoiding those that haven’t. Trend following Sector Rotation applies absolute price trend methods to position capital in those sectors that are actually rising in price and away from those that are falling. A few of us may use a combination of all of these methods as a multi-system approach.